At work today we discussed the need for a relatively sophisticated permissions system for controlling access to various features at a site we are building. I realized that something similar to what we were talking about was designed and built way back in the early 1980s on the PLATO system. 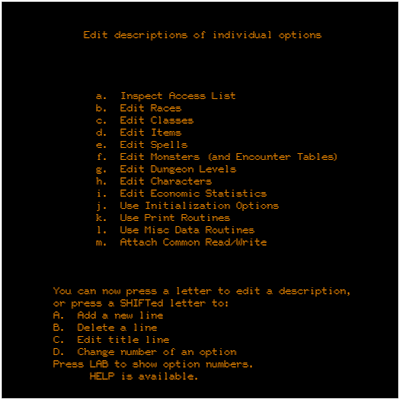 Here's an Antiques Roadshow tour of PLATO Access Lists using a game I worked on in college as an example.... (if you want the PDF version contact me). 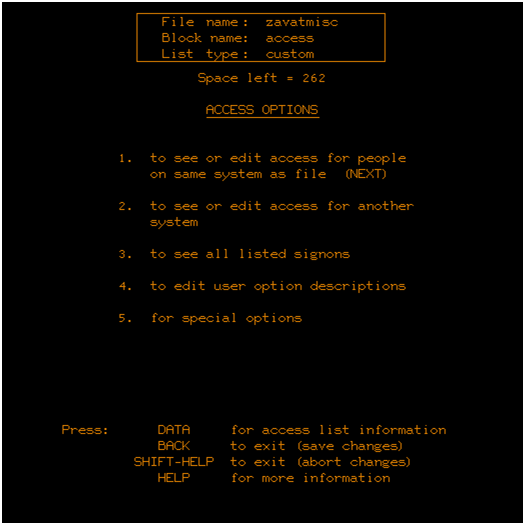 An Access List is a system-provided capability on PLATO that allows authors (developers) to create custom flags that can then be used to control access to various features of a lesson (program). 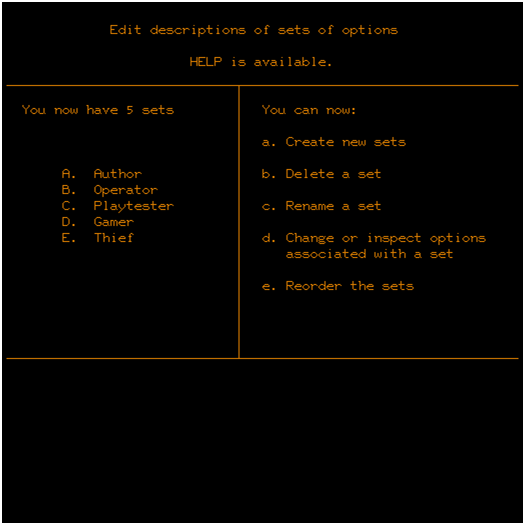 The example shown here is for Avatar, a popular RPG on PLATO. Keep in mind that this was created in the early 1980s and 512 x 512 plasma (orange) panel screens were state-of-the-art at the time. 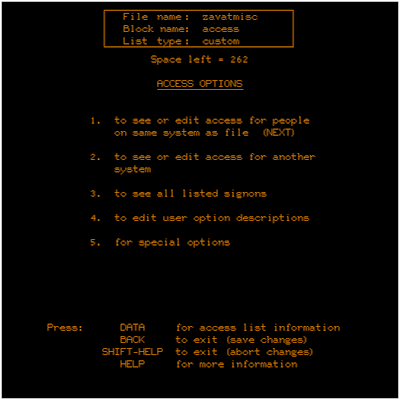 Thank you to cyber1.org for providing a working PLATO system! 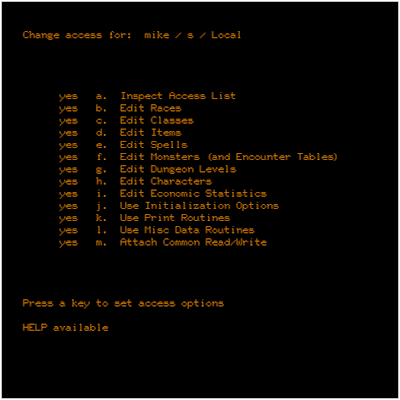 In an Access List there are roles (e.g. 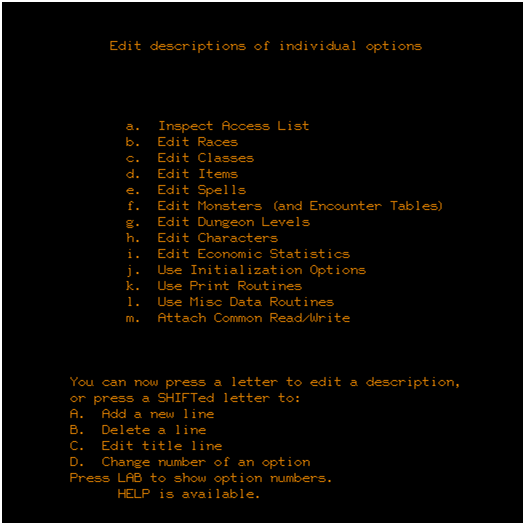 Author, Operator) that have sets of individual permissions. 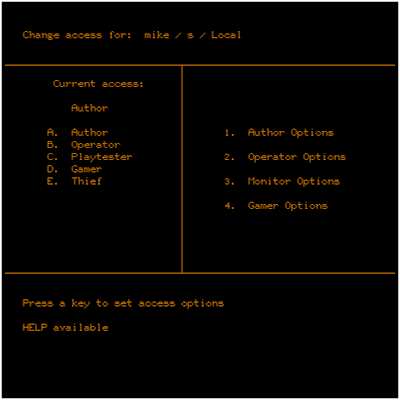 In this screen the roles can be set for the individual indicated (mike / s or mike@s in more modern lingo) by pressing a capital letter (A, B, C, D, E) or individual permissions can be set by pressing 1,2,3,4. 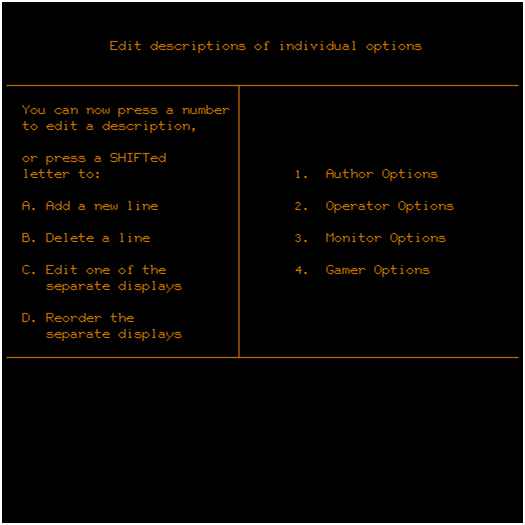 These are the individual options listed under the Operator Options (#2 above). 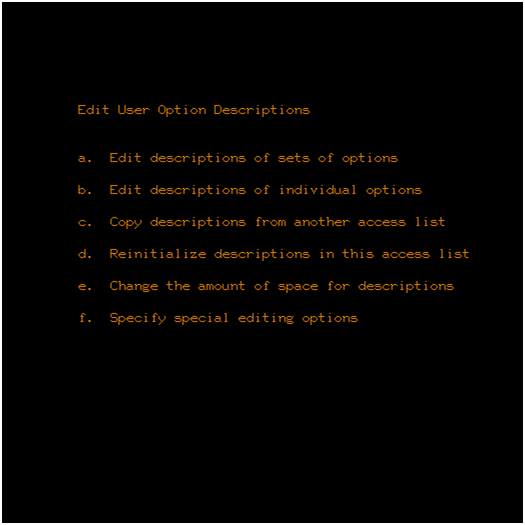 So you could set a user to have Operator access and then enable/disable individual flags for that user. 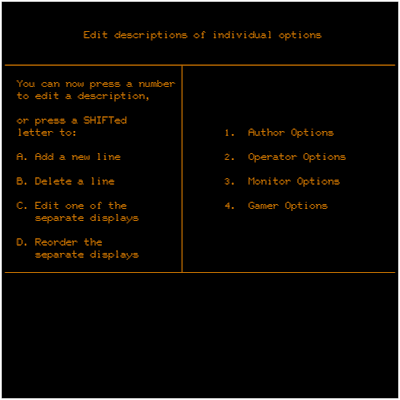 Individual options and sets of options (Author, Operator, etc.) can be custom defined by the Developer without any programming (next four screens). 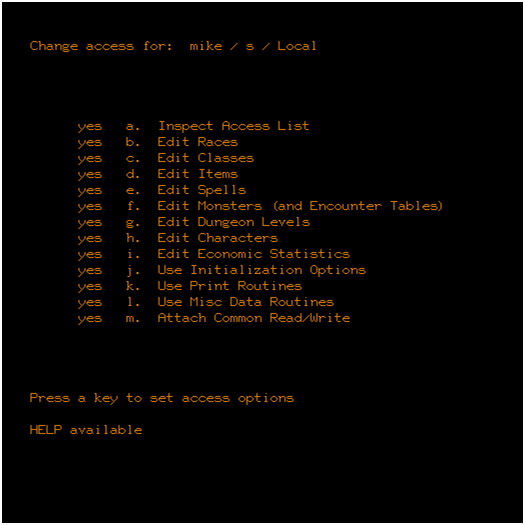 The Developer of course still needs to put hooks in their code to look at the Access List flags. 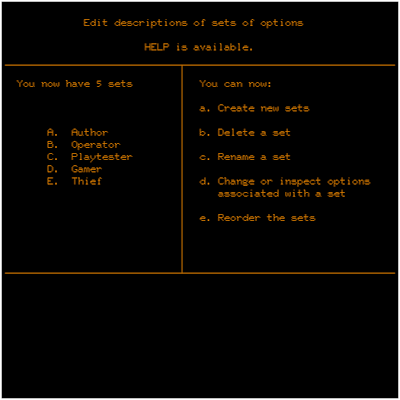 The Developer can edit the sets of options…. That’s pretty much it! 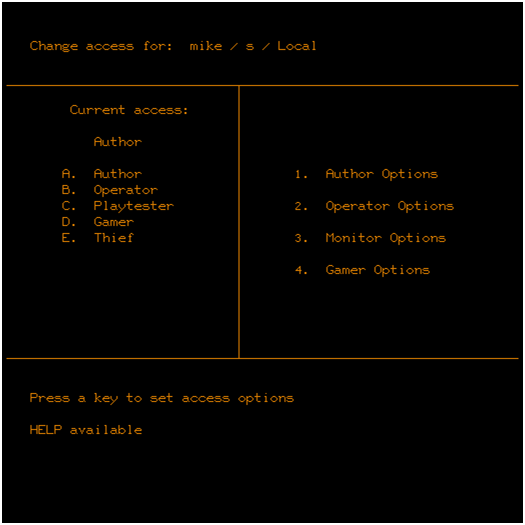 This is the main entry screen for Access Lists and may give you some other ideas.